- Frame measures 12" x 1" x 12"
Sloths seem to have a permanent smile on their faces. They look so relaxed and content, unbothered by the pace of the world around them or by what others may think of them. I love their self-acceptance and unencumbered life. 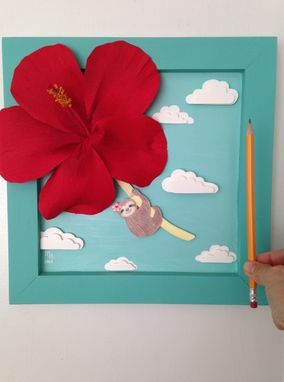 I imagine that a sloth might dream of floating away on a giant hibiscus, their favorite nom nom snack. When I see Slothie doing just that, I can't help but smile back at her. I hope you feel the same.